Most of the time a room monitoring attack is carried out by more or less smart RF bugs, in some cases even equipped with remote control to prevent quick and easy detection by counter surveillance scanners. But less sophisticated and low cost solutions like Intercom systems for the communication through the main lines most often are not taken into consideration. Such systems simply can be bought in normal stores, and by removing the housings, the basic components are small enough to be hidden in places of mains power distribution sockets or junctions. Therefore the risk of this kind of attack is enormous. 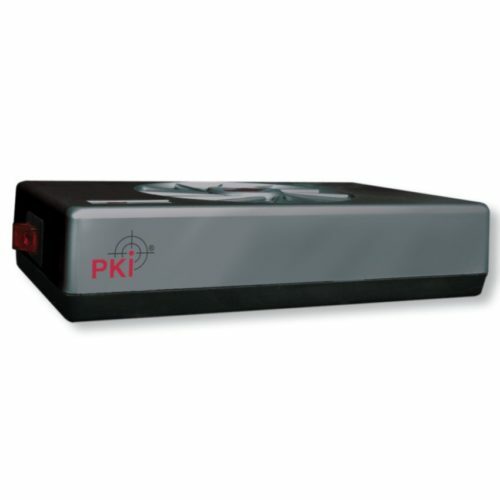 The PKI 6600 as a jammer system for mains protects sensitive areas against room eavesdropping through the mains line. PKI 6600 simply has to be plugged into the mains socket and is running fully automatic and disturbs the signal with an AM/FM-modulated noise. Direct listening to the target transmission is possible via headphone.